All kinds of cycling-related inquiries turn up in the inbox at at Pedal Portugal HQ (which is generally wherever my laptop happens to be). Some are one-offs – like advice on a particular route or contacts for local cycling groups (still looking). Others are quite unusual – like what are the best roads for skateboarding from Lisbon to Faro! But quite often I end up repeating myself with answers to a few common questions. 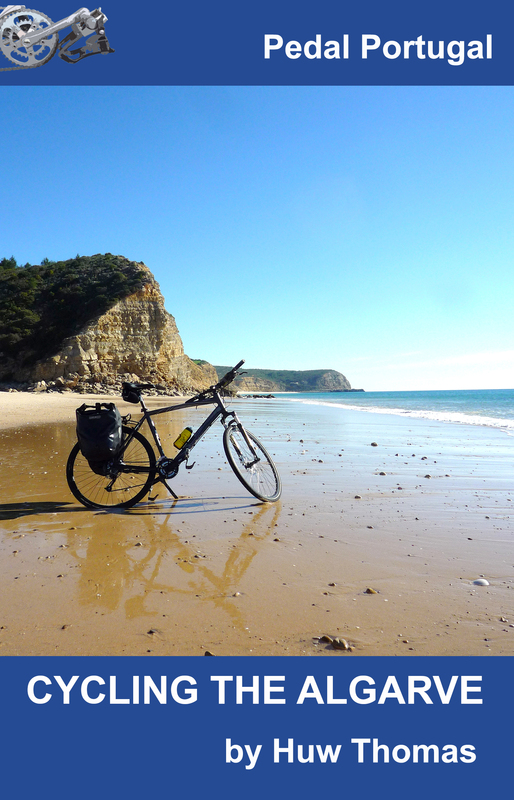 I could be rude and say ‘look at the website’ and you’ll find the answers but I thought I’d try and be a bit more helpful, save myself some work in the long term and put together my (current) top 10 hints and tips for anyone new to cycling in Portugal. This might be stating the obvious but it’s a very important point. There are flattish bits – mainly around the coast. But these also tend to be where most people are, hence more traffic and they’re also not generally the prettiest or most interesting parts. 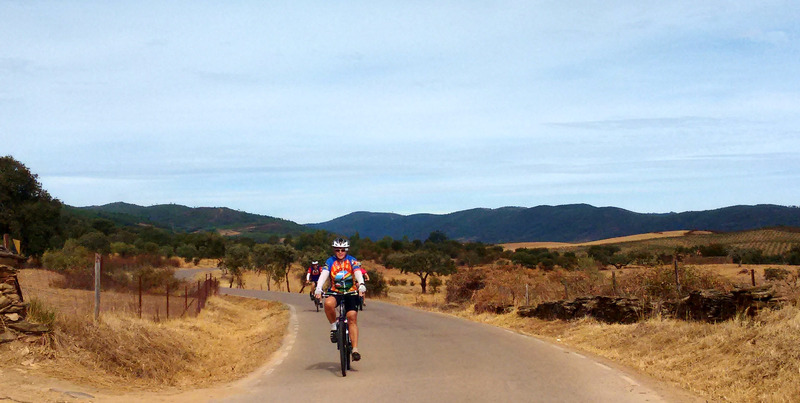 The Alentejo (one of my favourite areas for cycling) is what I would call ‘rolling’, with few major hills. Elsewhere? Well, I would define most of Portugal as rugged. The highest mountains in the country scrape in at just under 2,000m (6,560ft) and the majority are quite a bit lower. But much of the country is decidedly up and down. Deep river valleys cross a lot of it,meaning you’re going to do plenty of climbing – and need some good gears – if you plan to ride any distance. For more information on different areas of Portugal, go to the Day Rides section and look at the descriptions of the various regions. Unless you’re a lizard or otherwise used to extreme heat, don’t even think about doing any serious cycling in Portugal during the summer months. 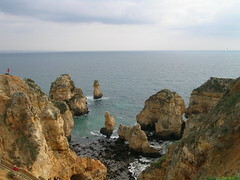 Portugal is one of the southernmost countries in Europe, with the Algarve on a similar latitude to parts of North Africa. For the Alentejo, and some other parts of the interior, afternoon temperatures of 40ºC (104ºF) and counting are normal during July and August. For pretty much anywhere in the country expect afternoon highs of at least 35ºC (95ºF). For cycling the best times to visit Portugal are generally the spring and autumn (fall) for the northern half of the country and any time from September through to April for the Algarve and the Alentejo. See When To Go… for more information. For most cyclists, printed maps can be useful for an overview of a region or route. Otherwise they are rarely worth the paper they are printed on. Invariably, maps of Portugal don’t show enough detail, are inaccurate or out of date. Often all three. If you want to navigate accurately – and find those little back roads – use an online map you can download onto a smart phone or other device. As an example, the image on the right shows part of one well-known company’s current map of northern Portugal. With a copyright date of 2011, it shows as a working railway a line that went out of service decades ago but leaves off many back roads – and ignores a new motorway that opened in about 2009. When planning a route, try checking it out on Google Streetview to get an idea of what kind of roads you’ll be riding on. See Roads & Maps for more thoughts on maps, plus information about Portugal’s roads network. No one is going to expect you to be fluent. In fact, most Portuguese people will be impressed if you can manage a few simple phrases in their language. Even if you only learn to say hello (ola), please (por favor) and thank you (obrigado or obrigada depending on whether you are male or female) it shows a bit of respect to the people whose country you’re a guest in and you’re guaranteed to get a better response from the locals. See Language and the accommodation glossary for a bit more information on the subject. Hopefully you won’t need it but if you’re ever involved in an accident or any other type of brush with authority, the first thing police or other officials are likely to want to see is your passport. If you need medical assistance of any kind, the Portuguese would never leave you lying by the roadside but they will ask to see copies of your insurance (including an E111 or EHIC card for European Union nationals). So don’t leave it at the hotel/campsite. On the issue of road safety, Portugal has a poor record and driving standards are not always that high. However, drivers are often extremely polite and considerate towards cyclists – once they’ve spotted them. I’ve had cars stay behind me for ages until they decide it’s safe to overtake – showing way more patience than they would in the UK. 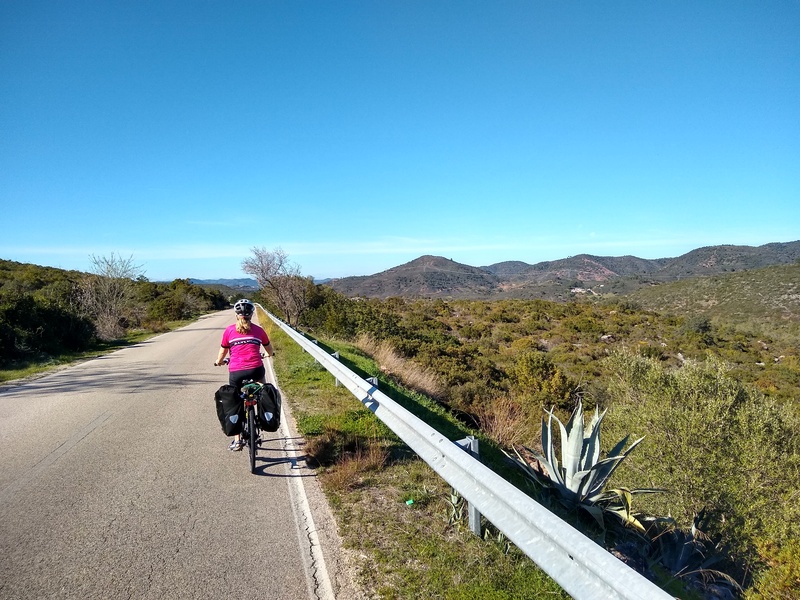 Many people who have never been to Portugal before have only heard of the tourist hotspots like Lisbon, Porto, the Algarve and the Douro Valley However, these are not generally the best places for cycling. The cities are definitely worth a visit but have lots of traffic, few cycle lanes and are mostly surrounded by some pretty ugly suburbs (same applies to Faro on a smaller scale). Instead of trying to ride out of the cities, use ferries and trains (urban and regional services) to get clear of the suburbs rather than waste precious holiday time riding through the grotty bits. There are some lovely parts of the Algarve to explore on two wheels but this region also gets way more tourists than the rest of Portugal combined so the coast in particular can be very busy (and quite built-up). 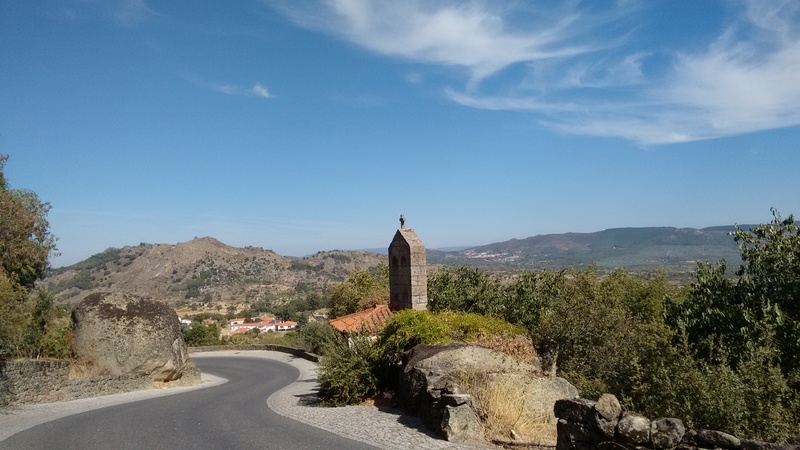 The Douro is a beautiful valley but is deep and narrow – there are no roads next to much of the river and where there are roads in the valley bottom – particularly closer to Porto – they tend to be relatively busy, with poor visibility and not a lot of room for cyclists. Also, if you want to go left or right you will have to climb some pretty major hills to get out of the valley. There are many other options to chose from. See the highlights page for a few ideas. If you are not cooking for yourself then your best chance of getting anything vaguely healthy is either to have a salad (often lettuce, onion and tomato and nothing else) or a soup. You can buy plenty of fresh veg and fruit in the shops but you’re extremely unlikely to get anything green served on your plate. When the Portuguese go out to dine they expect to eat meat or fish. Plus lots of carbohydrates. And lots of butter, salt and garlic. Vegetarian options are very unusual and anyone on a restricted diet of any kind is likely to struggle. Restaurants may be willing to help but even if you are able to explain what you want, don’t expect a lot of imagination if you want anything other than the dishes on the menu. Carrying a toolkit, spare inner tube and pump is sensible even if you’re going off for a short spin. But if you’re touring around it’s worth realising you can’t expect to find bike shops around every corner, so carrying other spares is definitely a good idea. Also, if you bring your own bike and it’s anything other than standard, you may have trouble finding spares as most cycle shops will have a fairly limited range. Racing road bikes and mountain bikes – only foreigners ride hybrids or tandems! – are what Portuguese cyclists ride and this is reflected in what’s carried by bike shops. I doubt if it is complete but see the Bike Shops & Mechanics page if you need it. If you are thinking of booking a guided or self-guided tour make sure you shop around. Many companies offer tours of Portugal and their prices are just as varied – even though they sometimes use the same hotels! The cost of guides, a back-up vehicle and the level of service and support you get will vary. However, decent food and accommodation in Portugal is cheap in relation to most other European countries. So compare prices, see what you’re getting and don’t pay more than you have to. This can be a problem for anyone who wants to get to a particular part of Portugal with their own bike or wants their luggage moved around while they ride. Some trains will carry bikes but not all (although guards may ignore the rules if they feel like it). The same applies to buses – you probably need to have your bike packed as if for taking on an aircraft if you want to take it as luggage. Taxis are another option – particularly for short trips – but this can be expensive. If you use taxis I would recommend you agree a fixed price before setting off on any longer journey. For more information on carrying your bike on various forms of transport, see this page. The other answer is to hire a bike and use a company that will deliver and collect to/from the start/finish points of your tour. Some people might want to tour by bike and have their luggage transported around for them. Unless you sign up for some kind of guided tour (see above), the only other option I can think of is using taxis. 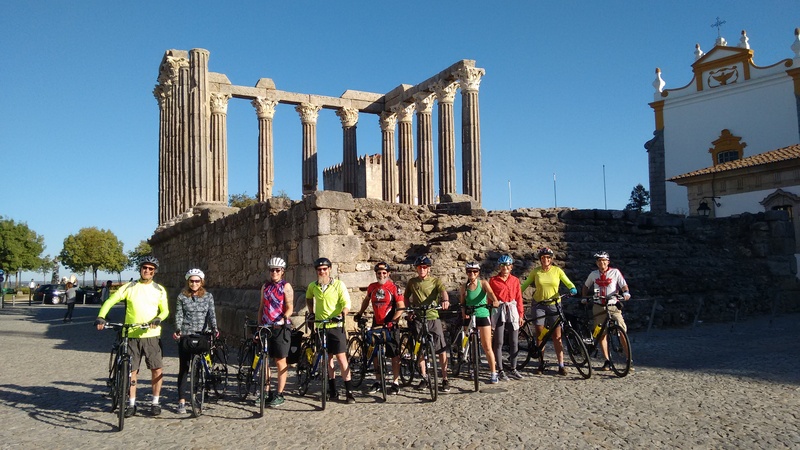 A group of Canadian cyclists who used my route planning services worked with a local taxi company who moved their bags for them on a tour of the Alentejo. But in other parts of the country? Possible but very difficult to arrange until you’re on the ground. I’d love to have feedback on these tips. Particularly if you can correct my mistakes or add useful extra information – I’m only one guy and I can’t know everything about riding in Portugal. Please use the box below to add comments or any tips you might have that will make life easier for your fellow riders. Hmm. Dogs are a funny thing – or not. I have very rarely been bothered by them but I’ve heard stories from other riders of being chased etc. I think a lot is down to the vibes you give off – whether you like dogs and whether you show any fear. My experience generally is that if you keep riding dogs who are that way inclined will chase you – it’s in their nature. My default approach is generally to “chat” to dogs in a friendly manner – being non-aggressive but also making sure I make it clear I’m not in the slightest bit afraid of them. Most dogs bark a bit but then don’t go any further – there are plenty that don’t take the blindest bit of notice of me on a bike. With Portuguese dogs, the other thing to do is to stop, bend down and pick up a stone – or even pretend to. Most dogs that see you doing that will turn tail and run! A squirt from a water bottle can also be a good way of calming down the situation. Having said all that, I can only think of a couple of occasions when I’ve been chased by dogs in Portugal. One time I was going too fast downhill to worry, the other time an annoying little yappy thing got too close and got a kick in the jaw. Don’t give up your passion – don’t show fear and stop and face a dog rather than run. Smile and say hello – and pick up a stone if that doesn’t work. Hi Carla, I’m an avid cyclist and have ridden all over the world. I always worry about dogs but nothing, so far, has ever happened to me or my cycling husband. BUT i do usually keep about 3 or 4 stones up my cycle shorts so I can access them easily and this has come in useful a couple of times. OR, in Albania, we were warned of stray dogs and to carry a bit of plastic tubing in easy reach (I put a piece about 2 ft long I found on the road on my handlebar bag. My bike looked like it had antlers!). Once you start waving that about they high tail it. Otherwise, I’ve been recommended to get off the bike (if you’re not hooning down a hill) and just keep it in-between you & the dog. The other thing I’ve done, is to slow right down and say “Good doggy”, (seriously!) loudly and a lot! As if they were a friends dog. The Albanian dogs I did this too were just barking and not wildly running towards me but I swear they were a bit taken a back and didn’t know what to make of me, getting bored and going back where they came from. Good luck. Thanks for the advice given. I’m cycling dark to Santander in early June 2018. Only came on your blog after my cycle. I cycled the Portuguese Camino coastal bit from Porto to Caminha and then onto Santiago. Actually I came on your site checking prevailing winds for Portugal. Not checking before was not remiss as it seems because the Camino finishes in Santiago, so I have to head North. But not being a proper pilgrim I was actually thinking of cycling the opposite way in the future, because prevailing winds, well, they prevail. Anyways, what I intended to comment on was the vegetables with meals issue. I was pleasantly surprised at the number of times I got loads of cabbage,and boiled potatoes with fish, or meats. Reminded me of my mothers cooking in the west of Ireland years ago ( I’m 60) . As soon as I crossed to Spain the culinary deprivation of five a day started. Like you say lots of nice fruit shops so I’d advice the same strategy of buying plenty fruit along the way. I also stopped at a little fruit stall outside a house and ate a big juicy tomato while chatting ( as best we could) to the old lady.While many drivers were courteous it was like the cyclist was invisible a lot of the time with the way the cut across you on roundabouts, junctions etc. They seemed to have a neurolinguistic hard wired programme that said “can I make it ?” Rather than like here thinking ” am I risking the life of the cyclist?”. I adopted a philosophy of “everyone’s out to get me, and no point being in the right if you’re dead”. Don’t get me wrong. I think the people are lovely, just “wired” different. Most trains in Portugal take bikes, I have taken mine in the train some have a place to put them for free. Need to check the rules, though. For example, CP (the Portuguese rail company) say they are NOT allowed in intercity services and regional services in the Minho. Thanks so much! It’s great to have this all in one place.